I have to take issue with some posts I read on a forum the other day about my favourite cookbook, Larousse Gastronomique. People were saying not to get it because it is of little use, with few recipes. I vehemently disagree. Larousse is certainly a book not for the impatient, but it is nearly “the bible” of the kitchen. I love it. It’s full of interesting recipes. No, you can’t find recipes for tacos, but it’s a French cookbook. Duh. The recipe as it appears in Larousse. If you’re looking for a recipe book that is all very neatly categorized with nice little easy-to-find recipes perhaps it’s not the cookbook for you either. But if you want to have a source for original recipes (or close) then run out and buy it. Or buy one from a used book store. They’re not cheap when new. Another issue cooks have with Larousse is that you already have to know your way around the kitchen. It assumes you understand some basic techniques and how things are supposed to look at certain stages. That comes with experience. Sometimes recipes are actually spread over different sections of this venerable tome. You may have to do one part using one recipe and then finish what you’re doing from another section. Sounds complicated, but it’s not. I have some real favourites from Larousse. One is the Génoise cake. If you want a perfect classic birthday cake – one that will stand up to slicing into thin layers and stuffing with all manner of fillings – that is the recipe for you. It’s not a light and fluffy cake, and well worth making. And it’s located in one spot in the book! The sugar and eggs need to be light and fluffy. 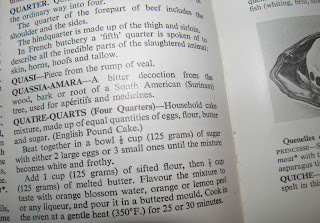 Another favourite of mine from the book is Quatre-quarts (four quarters), otherwise known as “pound cake”. It’s one we all should know how to make. 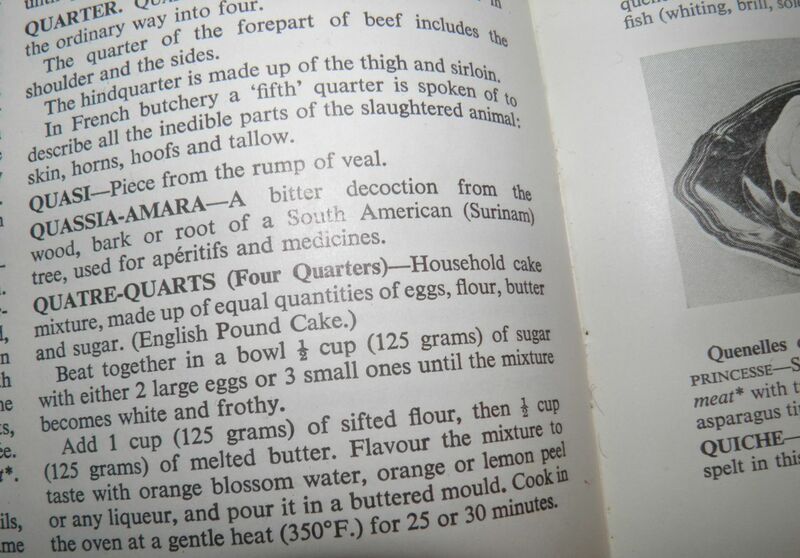 The terms “quatre-quarts” and “pound cake” are actually kind of self-explanatory once one knows. The names have to do with the weight of the ingredients. Quatre-quarts (the French variant) tells you to measure the sugar, eggs, flour and butter all in equal weights (in fourths). Mix in the usual way and you have it. 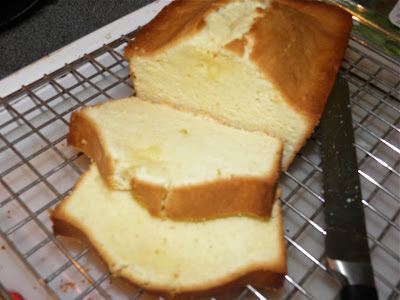 Pound cake (the English version) is the same. 1/4 pound weight of each of the ingredients is combined. Both recipes come from a time when things were weighed in the kitchen as opposed to measured. Feel free to get out your scale and make up your own quantities. Just keep in mind all four ingredients have to have the same weight. The following recipe is a classic from Larousse Gastronomique. I have doubled the amounts listed because I find it never makes quite enough. I have also increased the pan size to accommodate the extra batter. 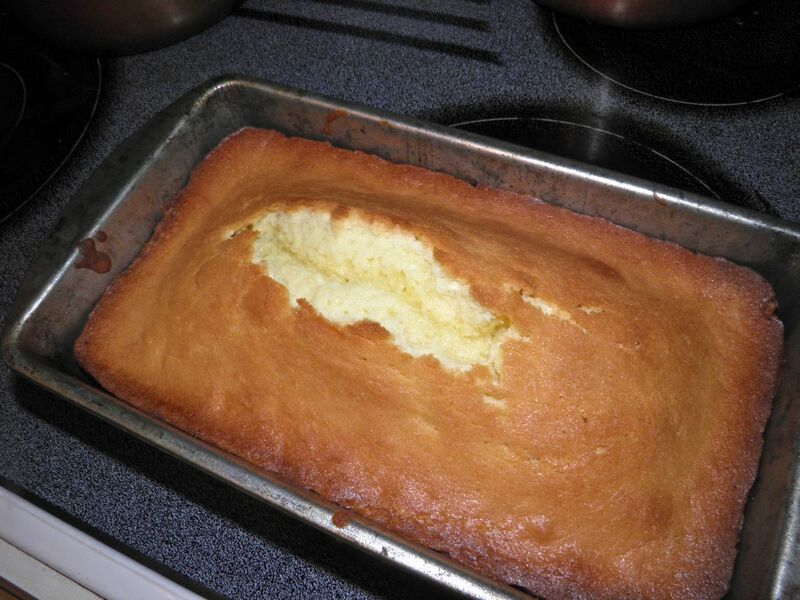 You can flavour this very basic cake in many ways. Vanilla extract is the most common, but lemon, orange and/or citrus zest are also possible. For an interesting twist you can also fold in fruit such as chopped strawberries, blueberries, etc. Preheat the oven to 350°F.generously butter the inside of a 5” x 9” loaf pan. 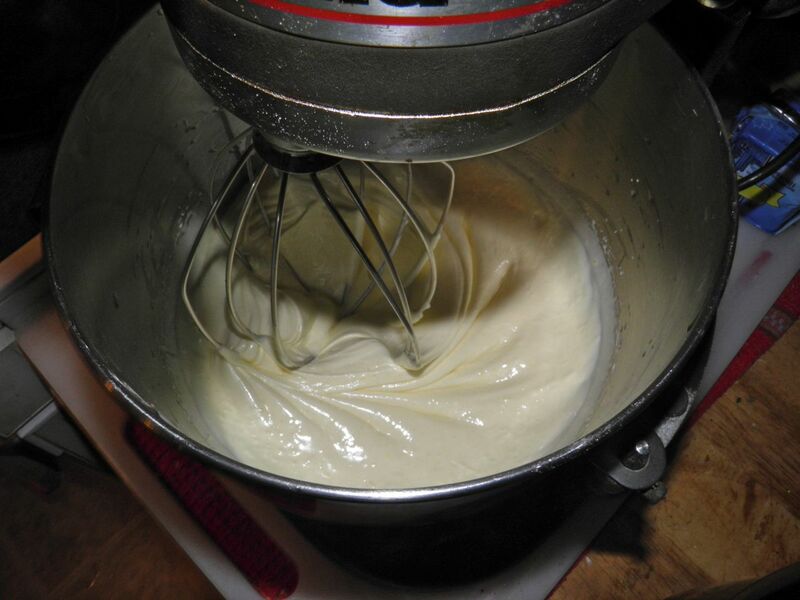 Cream the sugar and eggs together in your mixer using the whisk attachment. After several minutes the mixture will get very light and fluffy. This fluffiness is very important as it is the only “lift” the cake has. Turning the mixer to low, slowly incorporate the flour and butter, alternating between the two. Then add the vanilla and beat for a further minute. Pour the batter into the pan and place in the hot oven. Bake for between 45-55 minutes. The cake is done when it pulls away from the sides and has the characteristic bump down the centre with a crack in it. Let cool slightly. Slice and serve. You are correct, Larousse is the 'bible' of all cookbooks! Every kitchen should have one. We gave one as a gift recently to a friend who's quite experienced in the kitchen. He was thrilled with the gift and leaves it out on display because he loves and uses it often. Thanks for posting such a great recipe. It's in the oven as I write and is making the house smell amazing. My THM cookbook hasn't arrived yet, so I'm incredibly grateful for recipes like these.